The day started with a congregation of monks and nuns for morning Puja, Tsogspa. 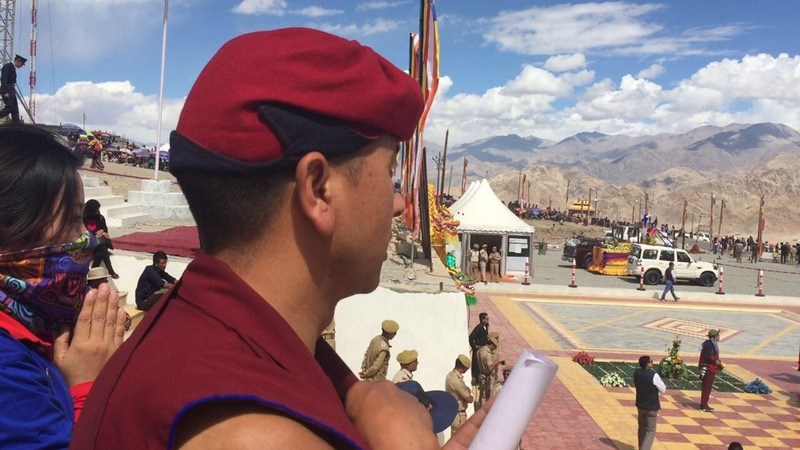 His holiness the Gyalwang Drukpa spoke to his followers about fifty stanzas of Guru devotion. After a short lunch break, the listeners learnt about the teachings on the legacy of Naropa for Himalayas and the world by Kenchen Tsewang Rigzin. Beautiful cultural programs filled the atmosphere with festive delight. Now is the best time to visit Ladakh, not just because of the Naropa festival but because the weather is perfect. The festival is to go on until the 22nd of November 2016. The Naropa festival happens only once in 12 years so if you haven’t visited Ladakh ever, now is the time to do so. Naro palace right below the famous Hemis monastery has been built especially for these grand celebrations. After the day long festivities, food and teachings, the Ladakhi monks and visitors get to enjoy brilliant performances by Bollywood stars. Choreographer Terence Lewis and his troupe danced on all popular Bollywood songs. The younger audiences enjoyed just as much as the older people. It was a magical night.